The human heart has four chambers; the two upper chambers are called the left atrium and right atrium, and the two lower chambers are called the left ventricle and right ventricle. The human heart beats thousands of times every day and pumps large quantities of blood each hour. It pumps blood through the lungs, where the blood is refilled with oxygen. Then pumps it back out to the rest of the body. 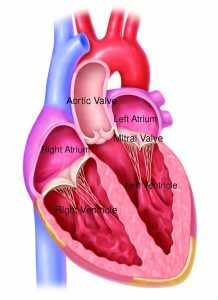 There are four valves in the heart that act as entryways between the chambers. Each valve consists of thin but sturdy flaps of tissue called leaflets. The valves open to let blood pass from one chamber to the next chamber and then close quickly between heartbeats so that blood does not flow backward. To make up for the backflow of blood, the left ventricle must work harder pumping to keep blood flowing through the body. This strain will eventually enlarge and weaken the heart. Over time, the extra burden on the heart and lungs may lead to congestive heart failure, a condition that arises when the heart can’t pump sufficient blood to meet the needs of the body; this may cause several symptoms. Left untreated, mitral regurgitation may lead to death. What is Significant, Symptomatic, Degenerative Mitral Regurgitation? One category of mitral regurgitation is called degenerative mitral regurgitation (also known as primary or organic). It can be associated with age, congenital disability, a history of rheumatic fever or underlying heart disease. If a patient has degenerative mitral regurgitation that permits a very large amount of blood to backflow into the heart, the cardiologist may diagnose the patient as having degenerative mitral regurgitation that is moderate to severe. If the patient also has symptoms of congestive heart failure or other related heart conditions, the disease may be categorized as significant, symptomatic, degenerative mitral regurgitation. Mitral regurgitation is common and affects approximately 1 in 10 Americans ages 75 and above. It is a condition that worsens over time and can severely impact one’s quality of life and lead to heart failure if left untreated. Treatment options for mitral regurgitation depend on how serious it is and how sick is the patient. The physician may prescribe medications that decrease symptoms such as fluid buildup in the lungs. Unfortunately, these medications only treat the symptoms and do not tackle the underlying issue with the mitral valve that is causing the disease. 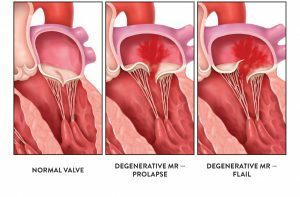 Degenerative mitral regurgitation can only be treated in two ways: mitral valve surgery or transcatheter mitral valve repair. Cardiologists prefer to repair the natural valve vs. replacing it. If the valve cannot be repaired, an artificial valve will be used. Even though open-heart surgery is an effective treatment for degenerative mitral regurgitation, the cardiologist may suggest an alternative treatment due to age, advanced heart failure, or other serious medical conditions that the patient may have. Patients who are too sick for open-heart surgery may be candidates for a less-invasive procedure called transcatheter mitral valve repair. Patients will be evaluated by a Heart Team in order to determine whether the patient is able to tolerate mitral valve surgery or if a potential candidate for TMVr. The Heart Team usually includes a cardiac surgeon and a cardiologist, who will review your medical history and perform a variety of tests. Who Should Not Have the Procedure? An evaluation of the patient’s heart will also verify if the heart valve anatomy would allow for successful placement of the device. How Should The Patient Prepare for TMVR Procedure? The procedure will most likely be performed in the hospital’s Cath Lab. Which is a specialized operating room. During the procedure, the patient is placed under general anesthesia and a ventilator is used to help with breathing. The Interventional Cardiologist will use fluoroscopy and echocardiography during the procedure to visualize the patient’s heart. Usually, the time required to perform the TMVr procedure is approximately 3 – 4 hours. Nevertheless, the time required for the procedure can vary due to differences in anatomy. The following steps provide a general summary of the TMVr procedure with the MitraClip. The cardiologist will make a small incision in the patient’s upper leg so that a guide catheter (a hollow, flexible tube slightly larger than the diameter of a pencil) will be inserted through a vein to reach the heart. The MitraClip is attached to the end of a clip delivery system and will be guided to the patient’s mitral valve through the catheter. The cardiologist will utilize imaging equipment to guide the placement of the clip. The cardiologist will implant the clip at the proper location on the patient’s mitral valve. The clip will grasp the mitral valve leaflets to close the center of the mitral valve and reduce mitral regurgitation. The cardiologist then performs tests to confirm that the clip is working properly. If needed, the cardiologist may implant a second clip for further reduction of mitral regurgitation. As soon as the clip is in place and working properly, it will be disconnected from the clip delivery system. The clip delivery system and the guide catheter will then be removed from the patient’s body and the incision in the leg will be closed. The implanted clip becomes a permanent part of the patient’s heart, allowing the mitral valve to close more tightly and reduce the backward flow of blood. Generally, the patient will stay in the hospital stay following this type of procedure 1 to 5 days, depending on the recovery and overall health of the patient. Most patients should experience relief from symptoms of mitral regurgitation soon after the procedure. The majority of patients will not need special assistance at home after being discharged from the hospital. While the patient is in the hospital, they will be closely monitored, and the doctor will perform several tests to evaluate the heart function. The physician may prescribe blood-thinning medications to help reduce the risk of developing a dangerous blood clot after the procedure. The medical staff will give instructions about the prescribed medications before the patient leaves the hospital. The patient will be discharged to the care of their cardiologist or family doctor for follow-up visits. It is important that the patient keeps all appointments for follow-up care and follows the doctor’s instructions. If the patient does not carefully follow their doctor’s instructions, the risk of complications and the possibility that the mitral regurgitation will return and will significantly increase. If the patient experiences any pain or other problems that may be related to the procedure or the return of any symptoms connected to mitral regurgitation, they should notify their doctor immediately. Limit vigorous physical activity (for instance jogging or exercises that cause breath-holding, or straining such as lifting heavy objects) for a minimum of 30 days, or longer if the doctor thinks it is necessary. Carefully follow the doctor’s instructions regarding medications, especially if blood-thinning drugs are prescribed. Call the doctor if the patient cannot keep taking their medications because of side effects, such as rash, bleeding, or upset stomach. Notify the doctor before any medical or dental procedure; antibiotic may need to be prescribed to avoid potential infection.